Google Analytics is a free service that webmasters or marketers can use to determine how long a user visited the website, the user’s geolocation, if the user has visited before, and where the visitors came from, also known as referrers. You can find Google Analytics’ code in thousands of websites, including search engines or some PDF documents. The entire IP addresses of end-users is not revealed by Google to webmasters, but only part of the IP address that will identify the location or region of the visitor. Note, websites that use a service that records entire IP address is not associated to Google Analytics service, at all. An example is a discussion forum where IP address used to register an account or post a message are stored. End-users cannot remove Google Analytics on their computer, except the cookies, but can prevent in loading them or they can be turned off using different methods. Some browsers include a Private Browsing feature. You should take advantage of this privacy feature so Internet cookies are stored. However, this feature does not prevent communication to the Google Analytics server. Internet Explorer 8 features an inPrivate Filtering feature you can use to prevent websites and content providers from receiving information about some websites you visit. You can also use this feature in IE to prevent Google Analytics. The image at the left is an example of how inPrivate Filtering automatically blocked Google-Analytics.com and Facebook.net because it was detected in three or more websites that I visited, even if I’m not viewing a Facebook or Google website, nor searching the Internet using the Google Web search. Another method to stop Google Analytics in reporting information to Google servers is to use host files for Windows, Macintosh or Linux computers. By using a customized host files, your Internet connection will not communicate at all with the Google Analytics server, thus preventing it from doing what it wants to do. There are free host files to download e.g., hpHOSTS or MVPS Hosts, but if you maintain your own host files, simply add www.Google-Analytics.com. Firefox and Chrome users who prefer not to use a host file may use NoScript or Adblock Plus to prevent Google Analytics. You can also block Google-Analytics.com Internet cookies to prevent storing of Google Analytics cookies on your computer. If you are using WinPatrol, you can use google-analytics or google-analytics.com to prevent Google Analytics cookies from being stored in Google Chrome, Internet Explorer and Firefox. WinPatrol automatically deletes the filtered cookies for you! Another method to stop Google Analytics in sending information to Google servers is by using the Web-filtering option in Internet security programs, e.g. Outpost Pro, Online Armor, Kaspersky Internet Security, etc. Note that not all Internet security suites include Web-filtering or a site blocking feature. which is quite odd. My computer ended up with Google Chrome browser instead. 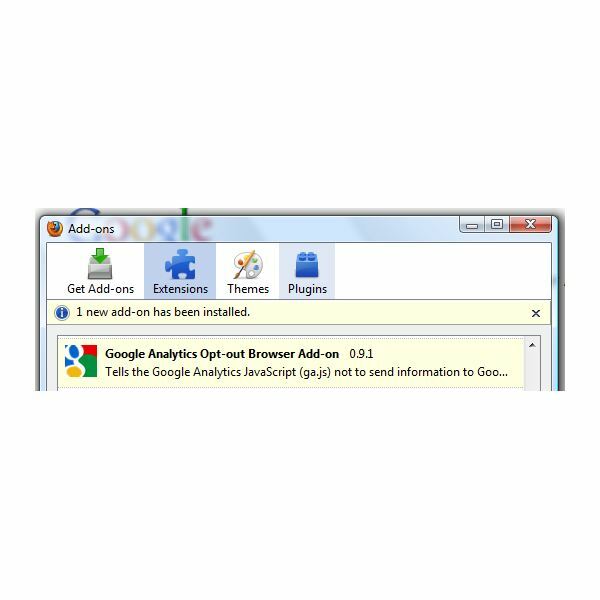 The add-on works well in Firefox so I suggest not downloading he Google Analytics Opt-Out browser add-on when using Internet Explorer, unless you want the Google Chrome browser, in addition to the said opt-out browser add-on. Preventing Google Analytics from tracking you is safe because it will not affect the website that uses a Google Analytics script or code. You will be protecting your privacy if you remove the Google analytics cookies and preventing communication to its server. Screenshots taken by the author, courtesy of Microsoft, WinPatrol and Mozilla. Information based on author's experience and research.